During the past week we attended two presentations to charity organisations. 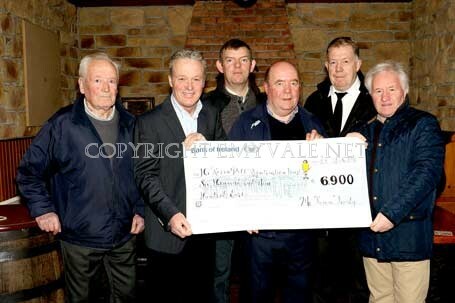 The first was to the Kevin Bell Repatriation Fund and this was presented by Peter McKenna. The McKenna family used the services of the Kevin Bell Trust to bring the remains of Alice, Peter's mother, home from France for her funeral. As a result and to show appreciation the family organised a Table Quiz, a Swim on Christmas Eve, and a Run in Rossmore and other donations and raised a total of €6,900 for the Trust and this was handed over to Kevin's father, Colin, in the Redboys. 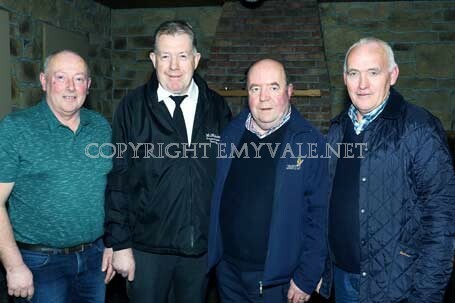 Present were Tom Sherlock, Gerard Sherlock, Eamonn Hackett, Peter McMahon (undertaker who organised the repatriation with the Kevin Bell Trust.) and Peter McKenna. 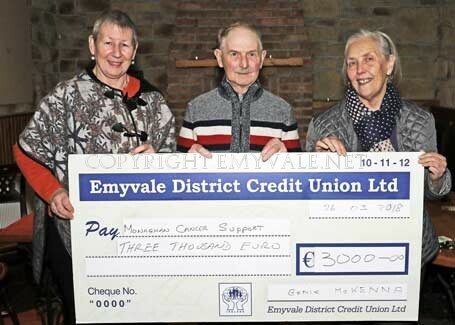 The second presentation, also held in the Redboys, was to North Monaghan Cancer Treatment Support and this was accepted by Mary Jo Earley and Maeve Hackett. It was raised and presented by Genie McKenna, Pullis, who wanted to assist with the great work being done by the Cancer Support group, which provides transport for Cancer sufferers to get to the place of treatment. Through donations and the proceeds of a very successful Fun Quiz, Genei was able to present the group with €3,000. While Colin Bell was in Emyvale he also met with John Sherry and Padraig Hughes who were the main organisers for a fund-raising Lawn Mower push last year and presented the proceeds to the Kevin Bell Trust.